I had some friends over this past weekend and since I had spent so much time cooking during the week for the Independence column, I was sort of burnt out. I wanted to make things for the gathering that would not take a lot of time to prep and cook but would nevertheless be tasty. 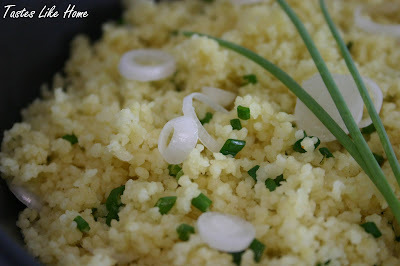 Everyone enjoyed the coucous with green onions and kebabs. I also made scalloped potatoes and a banana cake and served it with some strawberry sauce but I was too tired to take those pics. Please enjoy the couscous and the kebabs.